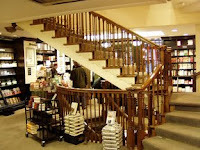 Sean said: "Although the bookshop of Cambridge University is technically the oldest bookshop in Britain, Hatchards of Piccadilly, which has been trading since 1797, is definitely the most aristocratic. Not only does it boast three royal warrants, meaning it supplies books to Her Majesty, it has counted Disraeli, Wilde and Byron among its regulars. Today it retains the spirit of days past, with an interior described by one follower as "reminiscent of being inside a rambling old house, with six floors of small rooms all linked together curling around a central staircase." Located opposite the Royal Academy, Hatchard's seems like a a bibliophiles dream. It's easy to get lost in this shop for hours, strolling from section to section from popular fiction via the computer manuals to travel guides and photography books. There is a help desk on each floor, with employees always there at your hand, if you need any, because most of the sections are rather east to navigate through on your own. Hatchard's is certainly the oldest bookstore having first opened to the public in 1797 by John Hatchard on one of then most fashionable streets in London. Spreading over five floors and with over 100,000 titles in stock, the shop is a heady mix of genuine character and first-class personal service. A favourite with both writers and readers alike, Hatchards not only holds regular book signings but can obtain any British book currently in print. Travel, fiction, history and biography genres are all well represented.